Update: My bottle of Diamine Pumpkin developed crud around the edge of the bottle. It seems this isn't the only Diamine ink that does this. This is my 2nd orange ink from Diamine, the first being Diamine Blaze Orange. This is a saturated orange with very subtle shading with wider nibs. The saturated colour makes it pops right off the page. I've always enjoyed orange inks, it perks up any regular writing. 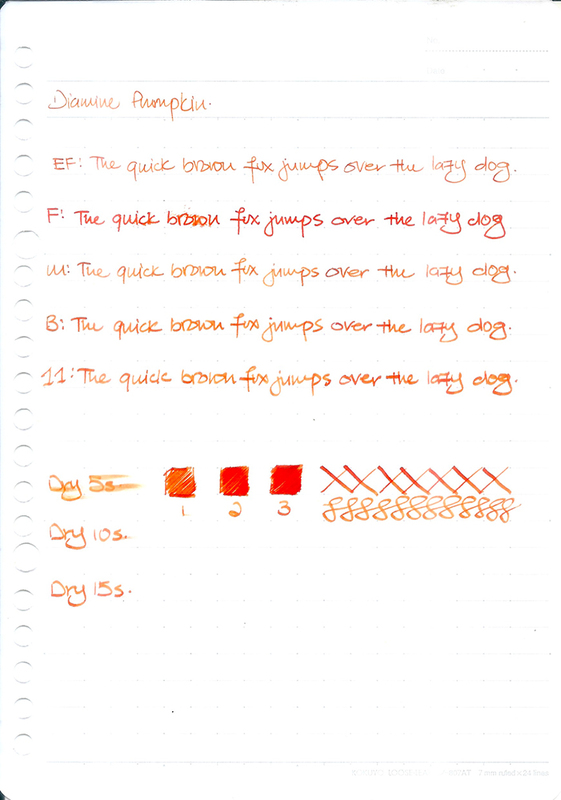 Diamine Pumpkin is wetter than Pelikan Edelstein Mandarin but the dry time is pretty good even on Kokuyo paper. It reminds me a little of Pilot Iroshizuku Fuyu Gaki except Diamine Pumpkin is less red.